So far in 2012, I have been banned in Arizona, smuggled (in written form, anyway) by librotraficantes in a truckload of “wetbooks” across several state lines, cherished by teens who now owned their own forbidden copies of a 30-year-old book of poetry, crowned with a wreath of laurels, and named the first Poet Laureate of the city of San Antonio. I cannot even begin to explain the cause for these contrasting events without a quick trip through history. I skim the news online every morning, making mental notes of where the world stands and where stands the fate of my people. I shiver at xenophobic legislation popping up in areas new to Latino settlement. I smile at the commercials from cell phone, toy, and cable companies pitching to the new “Latino market.” I cringe at the civil rights lost with legitimized racial profiling. I have watched the xenophobia in this nation grow and transform into a Latinophobia that now dominates the political dialogue in parts of the nation where Latino populations are new. I don’t come from one of those areas. I come from a place where Spanish-speaking settlements preceded the existence of the United States. My city saw Spanish-speakers join the community in 1718 and watched those Spanish-speakers blend in with our established indigenous populations. I come from one of those profoundly bicultural families that have been literate in two languages for five or six generations. And while I will never attempt to claim that there was no prejudice against the “Mexicans” of San Antonio, folks in San Antonio would have been hard put to try to claim shock at the longterm presence here of Spanish-speakers. Yet, there was always the stubbornly-pervasive Eurocentrism that faded Indian history into mere props for the early missions, and pockmarked Tejano history with segregation, exclusion, stereotyping, daily frisking of young students, and legal struggles for our basic civil rights. But we were here. We worked here; we built highways, neighborhoods, and businesses. It may not have been proclaimed loudly outside of our cultural community, but we were American citizens—most of us—and politicians of all colors came eagerly to seek our vote. We were empowered by the knowledge we kept alive through our oral histories and Spanish-language newspapers. We knew we had the highest percentage of Medal of Honor winners of any ethnic group in the United States. We knew we had a history in this country and had helped to build it. We knew this, but it was often not known outside our own barrios, and it was not recognized in the educational institutions. Even with the city’s long history of Spanish-speaking residents, it was difficult to find our literature or our existence reflected in our textbooks. But in the late 1960s, the Chicano Movement arrived, brimming with an affirming literature that reflected our bicultural, bilingual reality, and filled and delighted me! And while this new literature was not easily welcomed into traditional journals, the mere fact that it existed was enough to fill us with hope. Soon we were creating back garage presses. Magazines produced on kitchen table printers were churning out the material we knew had been left out of American history and American literature. Being part of that movement was liberating, exhilarating, transforming. It was the reclaiming of our voice and our identity. The big publishing houses may not have been open to us, but we were still making our voice heard, chipping away at the stereotypes, the racism, and the ignorance. We created our own publishing houses, developed our own critics, disseminated our own books. And slowly, very slowly, we began to be published by the major presses. My first book, Get Your Tortillas Together, co-authored in 1976 with Cecilio Garcia-Camarillo and Reyes Cardenas, was published in one of those kitchen presses. Many anthologies with larger presses followed. Curandera, my first solo book of poetry, in 1983, ended up being taught by teachers in classrooms throughout the Southwest. That same year, I appeared in an American literature textbook alongside Robert Frost and Carl Sandburg. Change was beginning to happen. By the 1990s I was regularly writing stories for school readers, stories set in Latino neighborhoods and with Latino characters. Then, Latino population numbers began to shift to new areas—no longer to the traditional Southwest but to North Carolina, Delaware, and New York—anywhere there were farms or factories or jobs. After 9/11, another element was added—a fear of terrorism. Pressured to respond to why national security was not tighter, President Bush blamed terrorism on the always-porous Mexican border to the south, and the thousands who crossed it without papers every month. This was news to many regions, coming simultaneously with a sudden sprouting of Spanish-speaking populations in areas that had previously had none. Societies, like adolescents, go through a crisis-filled maturation process. In Arizona, “Ethnic Studies” was banned in the state as a whole. Tucson USD, whose exemplary K-12 Mexican-American Studies Program claimed a 93 percent high school graduation rate—easily twice the rates for Latinos in most urban districts anywhere in the nation—shut down its Mexican-American Studies curriculum, and hundreds of books used in it were carted away, including Cisneros’ House on Mango Street, Freire’s Pedagogy of the Oppressed, Shakespeare’s The Tempest, Arturo Rosales’ Chicano! The History of the Mexican Civil Rights Movement, and my small and innocuous (I had once thought) Curandera. The very works that had helped young Americans in Tucson connect with literature and excel academically were now being withdrawn from their reach. From the standpoint of a writer, I was troubled. But from the standpoint of an educator, I was incensed. Did state administrators truly feel that this literature was anti-patriotic? Or was there a deeper fear—that these growing numbers of young, educated brown people would change the traditional leadership and socioeconomic hierarchy in the state? This was clearly a censorship focused on materials that made Mexican-Americans feel proud of who they were, and excel in school. Censorship was an important part of Nazi control tactics, and has always been a favorite tool of repressive governments. My conscientious educator-friends in Tucson blanched with anger. Some took early retirement; some moved to alternative settings; some stayed to protect their students from what they saw as a new reign of terror. Simultaneously, the city of San Antonio had been working on a vision for its future—a healthier, greener, arts-infused, education-oriented community. To stimulate the brainpower, literacy, and literary involvement of its community, leaders had decided to appoint a city Poet Laureate. The diversity of the score of nominees and of the national committee of judges was considered a special advantage, and my April investiture as the Inaugural Poet Laureate of San Antonio was celebrated in City Council chambers. While Arizona attempted to exclude the writings of its Mexican-American authors, San Antonio was embracing theirs as a reflection of who we, as a nation, are. Banned and Laureled—an odd combination, but one that buoys me up with hope. There is hope where people are willing to stand boldly against the tide, to resist a zeitgeist of fear, stereotypes, and distrust. Perhaps moments of crisis serve to create greater strength in individuals and in communities. It is possible that this moment of history, challenging the rights of all people to know and value their cultural heritage, will reveal more clearly the revitalizing power of diversity, the great wealth of opportunity that a diversity of creative solutions to our ever-more-complex problems brings to a society. I skim the news online every morning, making mental notes of where the world stands and where stands the fate of my people. You might think that “my people” refers to Latinos, but it doesn’t. “My people” includes my ethnic group, but also my political, ideological, and national heritage. I am concerned about the fate of an America that is represented by a statue with torch held high for the teeming hungry yearning to be free, and by a promise of equality for all. And even with all the censure, hate, and xenophobia that is happening, I am buoyed up by hopes that rise by reason of lightness, of clarity, that float and survive, despite the storm, because of our diversity. Dr. Carmen Tafolla, who earned her B.A. and M.A. 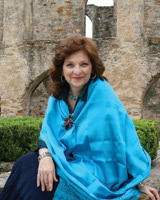 from Austin College and her Ph.D. from University of Texas, is the award-winning author of more than 20 books and was inducted in April as the First Poet Laureate of the City of San Antonio. As writer-in-residence for children’s, youth, and transformative literature, she teaches in the Department of Bicultural Bilingual Studies at University of Texas at San Antonio.